A new edition of Table manners [tafelmanieren] is here! This time it’s Studio Emma Sophia who’s deserving all the spotlights. Emma is a soft-spoken and kind-hearted woman and I was lucky enough to photograph her in our home. She creates beautiful handmade ceramics for everyday use. We love the feel and aesthetics of her work. Emma graduated from the fine art department of the Willem de Kooning Academy in Rotterdam. “I discovered ceramics shortly after finishing my fine art degree in 2014. I set out to do a simple beginners course in pottery to get myself back into making things with my hands after all the research and concept based art making in art school. It took only one lesson for me to become obsessed”. She quit her job in Rotterdam, gave up her apartment and moved back home to live with her parents. This enabled her to invest all her money she’s making (as a barista and cook) in her studio and business. Thats what we call dedicating for the craft! 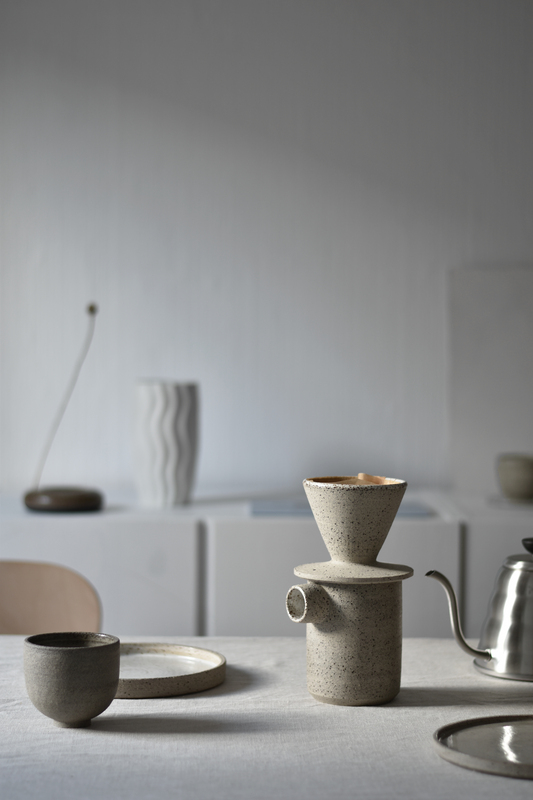 Studio Emma Sophia produces small batch handmade ceramics and functional pottery. All items are designed and made, from lump of clay to finished piece, by Emma herself, in her studio in Breda, The Netherlands. She rents her studio space in the former Breda prison building, a stunning 19th century panopticon dome. A very unique location to be working. Her studio was never a cell which is why it is a very bright and open space with positive vibes! Almost all work produced at Studio Emma Sophia is functional pottery; products that can be used on everyday basis. Her main method of making is wheel throwing, but she also loves handbuilding techniques and sometimes mixing the two. Focussing mainly on the colour and feel of the clay, she tends to go easy on glaze colours. Mostly using only white and transparant glazes. All ceramics are made using stoneware clay and fired in an electric kiln to 1220 degrees C (unless stated otherwise). It is watertight, strong and dishwasher/oven safe. If you want to know more about Emma and her ceramics, make sure to visit her website and give her a follow on Instagram. We hope you’ve enjoyed our new ‘table manners’ just as much as we did making the photo’s! Up to the next one!